I am a huge fan of Dave Ramsey’s baby steps from his book, The Total Money Makeover. It was the baby steps that helped us get rid of $140,000 in consumer and student loan debt, and we are not the only ones. Millions of people have taken his course and followed his baby steps as well, so you can be confident that if you follow these steps, you will build a strong financial foundation for you and your family. A foundation that will lead to peace and prosperity. Today we’re going to go over each step briefly and explain how they are so important to accelerating your path to peace and prosperity, financial independence. Let me just list what the baby steps are and then I will give a short explanation of each. To help you figure out where you are in the process here is a breakdown of what each baby step entails. Unexpected expenses happen to everyone, and for some reason they often tend to happen more when you’ve just committed to getting out of debt. In order to avoid being tempted to use your credit cards to handle these unexpected costs and rack up more debt, save a quick $1,000 and put it aside as a buffer for those emergencies that will happen. If in the course of paying off your debt, you have to use some of the money in your starter emergency fund, you simply stop paying extra on your debt and put any extra money into your starter emergency fund until it reaches $1,000 again. This step will help ensure that your credit card balances continue to go down and not up. The starter emergency fund also serves as training ground for both paying for emergencies in cash and for developing a habit of saving money. As a math geek I understand that paying off debts according to the highest interest rate first will save money in the long run, but the debt snowball is often a better choice when it comes to keeping you motivated for the long journey of becoming debt free. With the debt snowball method, you start by listing your debts from smallest to largest. You make the minimum payment on all debts, putting any extra funds toward the smallest debt until it’s paid in full. Then, you take the minimum payment you were paying on the smallest debt, the minimum payment on the next biggest debt, plus any extra funds, and put that money toward the next biggest debt until it too is paid off. This method of keeping your total monthly minimum payments the same and then adding any extra funds toward your current smallest debt means that you will pay off your debt at a faster rate than you have been up to this point. Being able to mark those smaller debts as “Paid in Full” more quickly will give you more motivation and faith that you really can win the battle against debt. Once you have paid off all your debt except for your house the next step is to increase your emergency fund until it contains 3 to 6 months’ worth of expenses for your household. To get this emergency fund built as quickly as possible is to take all of the monies that you were putting toward your debt snowball, which should now be paid off, and put it toward finishing your emergency fund. A 3 to 6 month emergency fund will keep you and your family well buffered against major financial emergencies such as job layoffs and large unexpected expenses such as major home repairs. Developing a habit of saving BIG money will make it easier for you to develop a habit of putting money into a separate fund for expected major expenses like I did to pay cash for my daughters wedding. After the consumer debt is gone and the emergency fund is fully funded, Ramsey suggests maxing out your retirement investing. For 2018 this means contributing up to the legal maximum allowed by the IRS of $18,500 a year for 401(k)’s and $5,500 a year for IRAs (Ramsey suggests 15% of your income). Those 50 and over can contribute an additional $6,000 to their 401(k) and an additional $1,000 to their IRA holdings. By maxing out your retirement investing based on your retirement funding goals, you are ensuring that your golden years will be secure and comfortable. One of the things I like about the college section of the Total Money Makeover book is that Ramsey is clear that college is not a guaranteed career success for your kids. He goes into great detail about how important it is to calculate the cost vs. the benefit of college before you go sending your kid out to spend $25,000 a year on schooling. It’s important during this step to talk with your spouse about how much money you can comfortably set aside for your child (ren)’s education. The dollar amount is totally up to you. Just be sure you research the different college saving options and make sure that what you’re planning on contributing to your kids’ college educations is affordable for your family – and make your plan clear to your kids so they know exactly what to expect from you where college education help is concerned. After you’ve paid off all consumer debt, have a fully funded emergency fund, are contributing at least 15 percent of your income toward retirement, and have a plan for contributing to your kids’ college educations, it’s time to dump the mortgage. Put all extra funds (based on having created a solid budget) toward that mortgage and get it paid off in full as soon as possible. The less interest you pay to the bank, the more money you have available to give to worthy causes and to fulfill your dreams, whatever those dreams may be. Here’s arguably the best step! Now that you owe no money to anyone and have a nice stockpile of savings, it’s time to start building some serious wealth. That wealth-building can come in a variety of forms. You can invest in mutual funds, invest in real estate or simply sock the money away in a high-interest earning bank. The goal is to put as much money as possible toward whatever your financial goals are, whether that means traveling the world, building your dream home or living life as a philanthropist. Now is the best time to start taking control of your money! I’ll be covering many topics to teach and encourage saving and debt freedom. 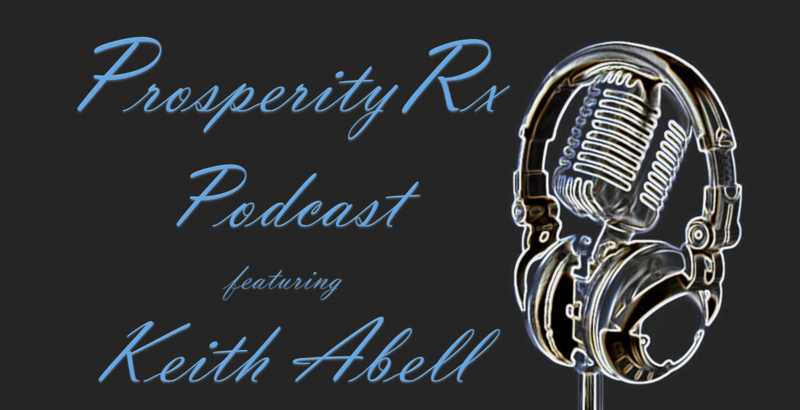 Be sure to subscribe to this podcast and my blog at ProsperityRx.com to learn how to save money, make a budget, pay off your debt, reduce your taxes and invest for your future. Also if you want to learn more about how to create extra income by starting a home business that requires no startup capital, no pyramid that requires a monthly auto shipment that cost you money every month instead of creating money, and no selling of lotions, or potions or pills, or quick magic diet aids that melt away inches in minutes or other such scam promotions visit http://AIMHighForSuccess.com. What guides us to different destinations in life is determined by the way we have chosen to set our sail. The way that each of us thinks makes the major difference in where each of us arrive. The major difference is the set of the sail. The same circumstances happen to us all. We have disappointments and challenges. We all have reversals and those moments when, in spite of our best plans and efforts, things just seem to fall apart.…In the final analysis, it is not what happens that determines the quality of our lives, it is what we choose to do when we have struggled to set the sail and then discover, after all of our efforts, that the wind has changed directions. When the winds change, we must change. We must struggle to our feet once more and reset the sail in the manner that will steer us toward the destination of our own deliberate choosing. The set of the sail, how we think and how we respond, has a far greater capacity to destroy our lives than any challenges we face. How quickly and responsibly we react to adversity is far more important than the adversity itself. Once we discipline ourselves to understand this, we will finally and willingly conclude that the great challenge of life is to control the process of our thinking. Learning to reset the sail with the changing winds rather than permitting ourselves to be blown in a direction we did not purposely choose requires the development of a whole new discipline. It involves going to work on establishing a powerful, personal philosophy that will help to influence in a positive way all that we do and that we think and decide. If we can succeed in this worthy endeavor, the result will be a change in the course of our income, lifestyle and relationships, and in how we feel about the things of value as well as the times of challenge. If we can alter the way we perceive, judge and decide upon the main issues of life, then we can dramatically change our lives. Set your sail for prosperity, get out of debt, create additional streams of income, and live life to its fullest. That is your prescription for prosperity. Saving money isn’t a matter of math—it’s a matter of priorities. We often tell ourselves we’ll start saving once we reach a certain milestone, like when we get a raise, we pay off the car, or the kids move out. But without healthy money habits, you won’t save money when you get that salary bump, when you own your car, or even when the kids are grown. You’ll only start saving money when you develop healthy money habits and your future needs become more important than your current wants. It’s not as overwhelming as it sounds. Yes, it requires dedication. But with a few tweaks to your spending priorities, you’ll be on the fast track to saving money in no time. Because they have competing goals. A lot of times the goal to save money isn’t a big enough priority to delay the purchase of that new smartphone, kitchen table, or TV. So we spend our dollars away or, worse yet, go into debt to buy the latest want. That debt then becomes monthly payments that control our paychecks and our lives. Let’s take a look at some facts about Americans and saving money. The average cost of living in 2017 was $57,311 yet 78% of Americans live paycheck to paycheck. The average American household debt is $137,063. Only 41% of Americans have a budget. 44% of adults can’t cover a $400 emergency. 42% of Americans aren’t saving for retirement. So What Is the Secret to Saving Money? You can stop the cycle of living paycheck to paycheck with a simple secret: Make a zero-based budget before the month begins. A budget is all about being intentional. It helps you create a plan to see where your money is going and how much you can save each month. It’s never too late to take control of your money! Saving money has to be at the top of your priorities and the top of your budget before you’ll gain any real traction with your goals. When you make a zero-based budget, you’re effectively saying, “I choose to put my future needs before my present wants.” It really doesn’t matter how much money you make—it matters how you spend the money you make. What Is a Zero-Based Budget? Zero-based budgeting is simple! It’s just a way of budgeting where your income minus your expenses equals zero. That’s all! With a zero-based budget, you have to make sure your expenses match what’s coming in during the month and you’re giving every dollar a name. Now that doesn’t mean you have zero dollars in your bank account. It just means your income minus all your expenses (outgo) equals zero. Basically that means if you earn $3,000 a month, you want everything you spend, save, give or invest to all add up to $3,000. That way you know exactly where every one of your dollars is going. You could be setting yourself up for disaster if you don’t know where your money is going each month. It’s no fun to look up one day and find out you have no money—and no clue where it all went! Write down your monthly income. – You can do this the old-fashioned way with a sheet of paper, or you can use our super easy and free budgeting app EveryDollar. Your income should include paychecks, small-business income, side hustles, residual income, child support, and any other cash you bring in. If it’s money and comes into your household’s bank account, it’s income! Be sure to write it down and add it all up in your budget. Write down your monthly expenses. – Before the new month even begins, write down every expense. Things like rent, food, cable, phones, and everything in between should be added to the list. But be sure to start your budget with the Four Walls—that’s food, shelter and utilities, basic clothing, and transportation.After you’ve got all the essentials covered, continue listing out the rest of your monthly expenses. Your needs will change from month to month, which is why you need to make a new spending plan every single month. Don’t get overwhelmed! Just focus on one month at a time. And don’t forget to plug your saving and giving categories into your budget! Saving money isn’t a matter of math—it’s a matter of priorities, and the same is true for giving. If you don’t make saving and giving a priority at the start of your budget, chances are you won’t make them a priority in the future. PLUS, giving is the most fun you’ll ever have with money! Write down your seasonal expenses. – Now think through the whole calendar year—what expenses will you have coming up that you can start planning for? You know Christmas is in December every year, so there’s no reason to act like it suddenly snuck up on you. Regardless of the occasion, make sure you prepare for those expenses in the budget. Things like birthdays, anniversaries and holidays are set dates that shouldn’t surprise you—or your budget. Next, think about all the irregular expenses that can pop up. Plan for those too! Things like car tag renewal fees, property taxes, and even your insurance premiums can be budgeted for. If you set aside a little bit each month, you won’t feel the strain of an expense “blindsiding” you all at once. Subtract your income from your expenses to equal zero. – We want this number to be zero, but it might take some practice to get there. Don’t be shocked or worried if they don’t balance each other out right away. That just means you need to do something to bring one of the numbers up, the others down, or both! It’ll take some work, but getting this written down is what will give you permission to spend without regret!If you’re spending more than you make, trim up the budget so your income and outgo equal zero. To cut back expenses, try buying generic at the grocery store, cutting the cable, using coupons or the store’s app, making coffee instead of buying it, or catching a carpool to work. If you need to bring in more money, start a side hustle or look for stuff around the house that you can sell to make quick cash. Here’s the deal with a zero-based budget: Every dollar must have a name! That doesn’t mean you have zero dollars in your bank account at the end of the month—it just means you have zero dollars left over in your budget. If you fill out every line item in your budget and come out $100 ahead (meaning you have nothing for that $100 to do), you haven’t finished your budget! You must assign that remaining $100 to something. Whatever you decide is totally up to you. But if you don’t give it a name, it will be spent, and you’ll end up wondering where that extra $100 went. And who wants to lose $100? Track and go! – All that’s left now is for you to track your expenses throughout the month. It’s the only way you will know if you’re spending lines up with your plan! This is how you’ll start winning with money throughout the month AND throughout the year. When you track your expenses and engage with your money, you actually make progress and learn to love your life—and your bank account. Having a zero-based budget is the quickest way to make your money goals a reality! Trying to get out of debt? Saving up for a safety net? Wanting to put money away for retirement? Guess what—you still need a budget. Remember, you’re the boss of your own budget. You get to tell every single dollar exactly where it will go each month. And don’t think of it as limiting your freedom. Having a budget actually gives you the freedom to spend money AND makes your money go further! Episode 7 – Are the People in Your Life Keeping You in Debt? On our last podcast we looked at 7 behaviors of people who are becoming debt-free SO today let’s take a look at the, “Poor, Pittiful Me Excuses” broke people make. They have this belief, Why make more money? Uncle Sam will just take it all away. They believe the system is stacked against them, the little man can’t get ahead. I’ve even heard some folks say that If they earn too much they’ll lose their public assistance. People. Sometimes you love ’em, and sometimes you don’t want to be anywhere near ’em. When it comes to your money, people can be a wonderful influence—like Dave Ramsey or your grandmother who never took out a loan in her entire life, even for those overpriced dentures she bought. But people can also drag you down. You know those people. And while you might love them and care a lot for them, their negativity can eventually wear you down. He leases a new car every two years. He’s tried to pull you into some wacky multi-level scheme at least three times. He somehow convinced you that your couch in the basement would be a perfect place for him and your sister to stay “for just a couple of months” while he looked for a job. That was a year ago. And he’s still looking. If it’s normal to be in debt, then that sadly means that a lot of parents are passing along bad money advice to their kids. If your dad encouraged you to sign up for a credit card the day you turned 18—to make sure you “build your credit”—then you should be extremely cautious about your dad’s financial advice for a long time. If your parents don’t understand why you’re working so hard to get out of debt, then it’s best to just avoid the topic of money at family gatherings. These “kids” are like overgrown financial leeches who thrive on video games, Dr Pepper and living off your income. Look, we know you love your kid. But love them enough to push them off the couch and into a job. Give them a time limit to find their own place and stop mooching off mom and dad. Sick of all the Facebook envy? You know, those friends who love to post all about their dining adventures and exotic vacations? You’d be surprised at how many of your “friends” are going into debt to have all that fun. They’ll be paying later while your fun is just getting started. You can just hear his Ben Stein-ish voice right now, can’t you? He might have told you about adjustable-rate mortgages or car leases or whole life insurance. If anyone takes the government’s advice on how to manage money, God bless their soul. Have you looked at our national debt lately? But every day, you’ll hear a politician go on and on about balancing the budget, paying off the national debt, and being more responsible with money. The only thing that grows faster than our national debt is our national spending. So when you hear someone in D.C. give money advice, press the mute button. Look, there’s nothing wrong with marketers. But if you aren’t responsible with your money, good marketers can talk you into buying anything. That’s why credit card companies make billions of dollars. They are extremely smart, and they know what they’re doing. If you stick to only buying what you can afford, then marketers will never get the best of you. Now, ultimately, your debt is your responsibility. You can’t blame anyone other than yourself if debt is weighing you down. The point here is that you can be influenced by other people, and it’s a good idea to keep a healthy perspective. As you work toward being debt-free, keep an eye out for these people. Now is the best time to start taking control of your money! I’ll be covering many topics to teach and encourage saving and debt freedom. Be sure to subscribe to my blog at ProsperityRx.com or to my podcast ProsperityRx to learn how to save money, make a budget, pay off your debt, reduce your taxes and invest for your future. Also if you want to learn more about how to create extra income by starting a home business that requires no start up capital, no pyramid that requires a monthly auto shipment that cost you money every month instead of creating money, and no selling of lotions, or potions or pills, or quick magic diet aids that melt away inches in minutes or other such scam promotions visit http://AIMHighForSuccess.com. People that feel like they earned it tell themselves that debt is ok because “I work hard, I deserve it,” or maybe they think “you’re only young once.” And a big killer that drives people into debt is “but we’re on vacation.” That one has made the “Happiest Place on Earth, the Land of the Mouse” a lot of money. Let’s take a look at two families. Family #1 manages to pay off $40,000 in debt in two years on a $35,000 annual income. Family #2 makes $100,000 a year but can’t seem to make the slightest dent in the same amount of debt. One of these families is on their way to becoming debt-free. The other is making the same mistakes they have been for years. You know there’s many factors that could be in play here, one of the most likely reasons is the second family has created a habit of overspending. They earn a great income, but they probably spend beyond their budget, which leaves them with less money and causes a lot of tension around the house. That’s a difficult and stressful way to live and I’m sure a lot of us can relate to it. The people who overcome that stress realize they have to handle money differently and make some lifestyle changes. When they make those adjustments, they begin to establish certain characteristics that are super important when it comes to becoming debt-free and staying that way. Personal finance is 80 percent behavior and 20 percent head knowledge. So, what are some of the behaviors of people who are becoming debt-free? Despite normal convention, these people realize debt isn’t a tool. Society tells us “you have to have a credit card to survive,” “you can’t go to college without student loans,” and “you’ll always have a car payment.” But those who are experiencing debt-free living don’t buy into these norms. Credit cards aren’t necessary for their everyday lives. Car payments don’t take a chunk of money from their budgets. They treat debt like leftovers they find at the back of their fridge. Whether it’s debt or week-old meatloaf, they get rid of it! Debt is normal. So be weird! Adults make a plan and follow it. Children do what feels good. Someone who really wants to get out of debt has the willpower to walk right past the shoe section or the flat-screen TV aisle without making an impulse purchase. They aren’t swayed to buy something simply because it’s on sale that day. They are wise enough to know, purchasing something isn’t going to erase all their problems and make them feel better. They know not to buy those things unless they can pay cash. They are willing to wait, work and save. A person who believes in their money plan doesn’t care what others think of them. They’re fine with driving an older car, because it doesn’t have a payment. They don’t need to take expensive vacations just to post a glamorous photo on social media. They actually look at price tags and not only at brand names. Why? Because they have given up on trying to keep up with the Joneses. And guess what? This kind of steadfast discipline frees up more money to attack their debts. With each debt they pay off, their confidence grows by leaps and bounds. No-brainer, right? Debt-free living is a goal, so people who want to accomplish it keep that objective in front of them. They set goals that are specific, measurable, achievable, relevant, and have an expiration date. They determine what they want to do and map out their strategy to make it happen. If you’ve taken Financial Peace University or if you have heard Dave Ramsey on the radio, you probably remember Dave talking about gazelle intensity. That’s when you are so fed up with debt you run as fast as you can (like a gazelle) in the opposite direction. This means they are looking to squeeze every single dollar they can from their budget. They are couponing, looking for sales at every turn, and even working a side hustle. They are all in. Looking for a side hustle to help you reach your financial goals sooner? I can show you how to start your own business no up-front investment, no pyramid that requires a monthly autoshipment costing you money instead of creating money, and no selling of lotions, or potions or pills, or quick magic diet aids that melt away inches in minutes or other such scam promotions. Stay tuned to the end and I will share with you how to learn more. Someone who is materialistic places too much emphasis on “stuff.” They borrow up to their eyeballs to pay for their vacation, car and oversized house. The person who is determined to get out of debt knows money doesn’t buy happiness, so they don’t fall into the trap of wanting as much stuff as they can get. They have become content with what they have and aren’t seeking to buy their happiness. Eating out, going to movies every week, and getting the premium cable package—these are the types of things a person might have to avoid while becoming debt-free. But keep in mind: Budget cuts are just temporary. Once the debt is gone, there is more room in the budget for those dinner-and-a-movie dates. Want to Be Debt-Free? You Can Do This! When you take a closer look at debt, you start to see it for what it is—something that holds you back. Once you see that, it’s easier to be patient, make sacrifices, and feel confident in your ability to pay it off. Before you know it, you’ll be enjoying debt-free living too! If you are like me I’m sure you heard folks say, “If everyone stopped borrowing money, the economy would fail.” Of course that’s not true. B) the massive amount of debt this society carries could actually BE the cause of an economic meltdown. I’ve also heard folks say, “I must be able to afford it if I was approved for the loan.” Folks, all the credit card companies and other lenders care is that you are paying them that high interest payment. And yes even a 5 or 6% interest payment is high when you consider how little these same institutions pay you for your savings, if you even have a savings account. And my favorite is, “I need a house payment for tax purposes.” You’re paying way more in interest than you are ever saving in tax deductions. Have you decided to get out of debt? Are you drowning in last year’s expenses and tired of paying for the past instead of planning for the future? You’re probably sick and tired of being sick and tired. You might even be angry at being in debt. Eventually, the stress of too many bills and the burden of debt piling up pushed you to your breaking point. Something inside “clicks,” and you decided it’s time to make a fresh start. But what keeps people from getting out of debt? Why would someone want to stay in debt instead of living in freedom? Sadly, there are all sorts of reasons people choose that shiny credit card instead of being debt-free. Don’t fall for any of these! 1. They want to keep up appearances. This is the dreaded “keeping up with the Joneses” mentality. But little do you know, the Joneses have a leased BMW, an underwater mortgage, and an unwelcome visitor named Sallie Mae living in their basement. The Joneses are the most broke people in your neighborhood! And if you’re not careful, you’ll be following them into bankruptcy by trying to keep up with them. 2. Reason People Stay in Debt: They don’t think they make enough money. Most of the time, it’s not someone’s salary that’s the problem—it’s their behavior. Spending more money than you make will cause you to stay in debt. That’s why we say it’s so important to budget. Budgeting can help you see where your money is going every month and where you can cut back. Simply making a budget and being intentional with your money will make you feel like you got a raise! That’s not to say income doesn’t play a large role in why people stay in debt. Sometimes it really is an income issue. If that’s the case for you, start doing things to bring in extra cash! Get a part-time job on nights or weekends and sell everything that’s been collecting dust in your garage. Or maybe it’s time to get bold enough to ask for a raise or put your resume out there and start looking for a higher paying job. I can show you how to start your own business to get out of debt with no up-front investment, no pyramid that requires a monthly auto shipment costing you money instead of creating money, and no selling of lotions, or potions or pills, or quick magic diet aids that melt away inches in minutes or other such scam promotions. Stay tuned to the end and I will share with you how to learn more. 3. Reason People Stay in Debt: They are Unwilling to Sacrifice. How could you possibly give up eating out three nights a week? Or what would your life look like without cable? You’ll never know until you’re willing to give something up in order to build a legacy for your future. If you’re in a lot of debt, something in your lifestyle has to change. Here’s a question to ask yourself: What am I willing to temporarily give up? 4. Reason People Stay in Debt: They have No Hope. When you’re buried under thousands of dollars of debt, it’s easy to feel like there’s no way out. After making minimum payments month after month and seeing little or no headway, sometimes you feel like you’ll never see the light at the end of the tunnel. If you can’t find a reason to keep up the fight, sooner or later you’ll probably just throw in the towel. Some people stay in debt because they’re too afraid to make a move. Debt can be comfortable, kind of like slowly cooking in a pot of boiling water. If you’ve always used a credit card and you’ve always had a car payment, I remember thinking years ago, “I’m always going to have a car payment, I might as well get a new car every year or so.” Boy does it feel so much better today to have a paid for car and not have that payment over my head every month. Sometimes it’s hard to make that change. Sure, trying to pay off all of what looks like a mountain of debt can be scary and overwhelming. But remember this: Millions of people have gotten out of debt and changed their lives by following Dave Ramsey’s 7 Baby Steps like we did. You can do this! In other words, they’ve bought into the myth that you are what you own—and they simply can’t get enough. The more they have, the more powerful and confident they feel. But it’s all fake. They can’t afford that stuff and it’s going to weigh them down. At some point their addiction to debt will cause a financial heart attack. Our culture has twisted what it means to actually be able to afford something. Society echoes, “If you can ‘afford’ the minimum payment, then go ahead and buy it!” That’s just ridiculous, and it’s a sure ticket to financial regret. You’ll end up spending more on monthly payments to pay it off than if you would have just bought it outright! Instead, don’t buy things you can’t pay for in cash. 6. Reason People Stay in Debt: They don’t make it a priority. They keep putting it off thinking, I’ll start a budget next month. But each month passes by and guess what? Still no budget. Paying off debt isn’t exactly a fun pastime. It takes a lot of work! We know changing your lifestyle is uncomfortable, but the end result is, it is 100% worth it. Make it a priority! 7. Reason People Stay in Debt: Their spouse isn’t on the same page. Money and relationships can be tricky territory, especially when a couple isn’t seeing eye to eye. Maybe one of you is fully committed to becoming debt-free and the other isn’t quite convinced that debt is all that bad anyway. If you really want to get out of debt, you and your spouse have to be on the same page with the same vision for your future. And remember, it’s not “my” money or “their” money—it’s our money. Once you get married, your vocabulary needs to change. You’re on the same team, and it’s time to start acting like it. The same goes for your debt. It’s not “his credit card debt” or “her student loans,” it’s your collective debt together. And if you want to get rid of it, you need to tackle it as a united front. 8. Reason People Stay in Debt: They aren’t managing their money. No wonder so many people feel like they’re spinning their wheels getting out of debt! If you don’t have a monthly budget, you don’t really have a plan for your money. You aren’t telling your money where to go, so it’s going out the window! Managing your money means more than just tracking your expenses after they’ve already happened. You have to prepare ahead. There is a free budgeting app, EveryDollar, from the Lampo Group that you can find in your smartphone app store that makes it super easy to create a budget. You’ll finally wave goodbye to stressing out about your money once you actually take control of it. 9. Reason People Stay in Debt: They haven’t cut up their credit cards. Getting out of debt is amazing. But if you keep those credit cards around for a rainy day or “emergency,” you’ll likely land yourself back in debt again. Just don’t do it. Cut them up, close the accounts, and be done with them forever. If you follow our plan, your emergency fund is your safety net—not credit cards. 10. Reason People Stay in Debt: They don’t know how. These people have good intentions—they want to kick debt to the curb—but they don’t know how. They’ve been in debt so long that getting out from under $50,000 in credit card bills seems impossible. But it isn’t. People call The Dave Ramsey Show every day to tell about their debt-free victories. Getting out of debt isn’t easy. It takes a lot of hard work and discipline. But it is not impossible. All you need is a plan. In Dave Ramsey’s book, Financial Peace he introduces the debt snowball method as a simple plan for helping you get out of debt. Start by listing out all your debts from smallest to largest. Keep paying the minimum payments on everything except the lowest debt—we want you to attack that one with a vengeance! Once it’s gone and out of your life forever, take the amount you were paying on it and roll that over to your next debt on the list. It might not seem logical to start with the smallest debt and work your way up. It might seem more logical to start with the highest interest rate first. Trust me! By starting with the lowest debt first, when you pay off that smaller debt the feeling of victory and accomplishment motivates you to keep going. So what if it might on paper take a couple extra months. When doing it the other way, most people never finish, they give up, the feeling of hopelessness squashes all the motivation they had in the beginning when they started. People are making the decision to get out of debt and change their lives every day. They’re making sacrifices so they can live like no one else! Are you next? Take control of your finances—and your life—by deciding to get out of debt for good! Also if you want to learn more about how to create extra income by starting a home business that requires no startup capital, no pyramid that requires a monthly auto shipment that cost you money every month instead of creating money, and no selling of lotions, or potions or pills, or quick magic diet aids that melts away inches in minutes or other such scam promotions that you see all over social media visit http://AIMHighForSuccess.com. On our last post we looked at the group of excuses called “Family Comes First Excuses.” I encourage you if you haven’t listened yet to go back and do so. We’ll pay it off when the tax return comes in. I’ll start my budget next month. I’ll worry about the future when it gets here. We’ve all procrastinated when it comes to getting our financial house in order. The key to do it successfully is by creating a budget. However you’ve probably heard a lot of trash talk about budgeting over the years. Or maybe you tried budgeting in the past and didn’t stick with it each month. But don’t judge budgeting until you hear me out! Having a budget is essential to helping you beat debt and win with money. It’s the map you need follow to get where you want to go in your journey. First I want to debunk some of the top budgeting myths so you can start winning with money. Then I want to show you how setting some goals can get you the motivation to overcome procrastination. 1. I don’t have time to budget. If you’re not doing a budget because you don’t think you have the time, consider taking a fresh look at your priorities. You might be surprised at how many “things” you could let go of in order to get your finances back in shape. You know, those things that really aren’t as important as taking control of your money. It’s true that you might spend a few hours a month mapping out your expenses when you first start budgeting. But after those first few months, it’s pretty much smooth sailing! You’re simply plugging in numbers and letting math do the rest. The Budgeting Myth is Making a budget is difficult and I hate math. Speaking of math, this isn’t rocket science. If you can do basic third-grade math, you can make a budget. Your income minus your outgo needs to equal zero. That’s it! Seriously, hating math is a pretty lame excuse. Instead of hating math, why not hate being in debt? Don’t stay away from the budget because “math is too hard?” It’s not. There is a free budgeting app EveryDollar from the Lampo Group that you can get from the app store on your smart phone that does the math for you! The third Budgeting Myth Budgeting is boring. You’d be amazed at how many people don’t make a budget every month because they think it’s boring. You know what else is boring? Credit card statements. And collector calls. And bankruptcy court . . . actually, all of that is pretty awful. If you’re a free spirit when it comes to budgeting, stop and take a breath. You can do this! Once you get the hang of it, making a budget isn’t bad at all. And as time goes by, you might even find it a little fun. Imagine that! Get your spreadsheet-loving, planner of a spouse or friend to help give you that extra push. Budgeting is key to helping you get out of debt. And being debt-free? Now that’s fun. The fourth Budgeting Myth I can do a budget in my head. If you can seriously do a zero-based budget in your head every single month, we’ll assume you’re the most brilliant person on the planet. Could you please help our government make a budget? A budget in your head isn’t a budget. It’s just a kinda-sorta-vague-idea-of-what’s-being-spent thing. For a budget to work, it needs to be something you can track. And if you’re married and doing a budget in your head, that means only one of you is involved in the decision making—and that’s a definite no-no! You need to be working together. The fifth Budgeting Myth I budget by keeping track of everything I spend. That’s a start, but it’s not a budget. When you only track spending, you’re always looking at the past and never looking forward. Your budget is your game plan for the upcoming month. You’re planning what you’ll do with the money you haven’t spent yet. When you keep receipts or use your online bank statements to see what you spent last month, you’re doing just that—looking at last month. You need to plan for your future spending while looking at your past spending, not just one or the other. If you’re already tracking your spending, the budget is just a natural next step. Number 6. A budget is too restrictive. You don’t want to give up your Saturday morning coffee and bagel at the corner café, we get it. Don’t worry! You can keep your weekly caffeine and bagel combo, just put it in the budget. What does that mean? When you create your monthly budget, be sure to include things you enjoy. Budget for that weekend treat, Friday night takeout, or trip to the movies. Having a budget doesn’t mean you can’t have fun anymore. Believe it or not, a budget actually gives you the freedom, the permission to spend your money! Number 7. There are always unexpected expenses, so why bother to budget? Sure, things can come up unexpectedly. But that doesn’t mean your budget has to suffer because of it! In our experience, things aren’t always as “unexpected” as they seem. You know your friend’s baby shower is coming up next month, you know when your car registration is due, and you know Christmas is in December every year. Be sure to plan for those type of things in your budget. And if you find you really, truly keep having unexpected costs to cover, add a “miscellaneous” category in your budget. Use it as the catch all you can dip into when something unexpected arises. Just remember not to abuse it. 8. Budgeting means I can’t go out to eat anymore. I hate cooking! You hate cooking? Join the club! First of all, the rumors are true. You can actually eat at home without having to cook. Keep a rotation of PB&J, soup, tuna and salad on hand, and you’ll be set! But really, it’s worth it to learn how to cook a few good meals. Pro tip: The slow cooker is your friend. Having a budget doesn’t mean you never set foot in a restaurant again. You just have to budget for it. Add a date night or girls’ night out line item to your budget. Add a column for Chipotle, Chick-Fil-A and everything in between if you want to. The point is, just make sure you have room for it in the budget before you spend any money there. 9. It’s not the right time for me. Is it ever going to be the right and most optimal time? Not really. Something will always come up. That’s life. Are you putting off starting a budget just because you have a birthday or anniversary coming up? Don’t let that be your excuse! If anything, you need a budget now more than ever. A budget helps you figure out how much you want to spend on the gifts and festivities. Sure, every month will look different, but here’s the great thing: You know the date of those holidays, birthdays and anniversaries. They don’t ever change! Put them in your budget months in advance so you can start saving. 10. I make plenty of money . . . I don’t need a budget. If you think doing a budget is only for people who have trouble making ends meet, think again. We’ve been making a budget every month since he we started nearly 20 years ago. It doesn’t matter if you have $100 to your name or if you’re a millionaire—you need to tell your money where to go. Everyone needs a budget! I hate that so many people fall for these budgeting myths and excuses, but you don’t have to be one of them! You have the power to take control of your money, all you need to do is take the first step. If you need some extra motivation, try setting a financial goal. Think about something you’ve always wanted to do. Go on, let yourself daydream a little. Is it skydiving? Going back to school? Starting your own business? Backpacking across Europe with your best friend? Getting a dog? Whatever it is, now is the time to end all procrastination. Too many people waste their time thinking about something they want to do, but very few people actually do it. Don’t let yourself become another sad statistic of someone not being motivated enough to pursue their goal. Think about what’s stopping you from chasing your dream. Is it fear? Are you afraid you’ll take a chance and fail? Maybe it’s money. Are you so worried about money that you let it push your dreams to the side? A lot of people use time as an excuse. We’re all busy, and it’s no secret that Americans are getting even busier and have problems saying no. But you can’t let any of the excuses put a halt on your goals. If you want something bad enough, you will make the time to turn your dreams into realities. Figure out what’s stopping you from pursuing your goal, and determine a way to get around that. Here are five steps to take your aspiration from a pipe dream to a page in your personal history book. Remember what stopped you from pursuing your goal until now? Well, come up with a plan to not let that reason stop you anymore. Whatever the issue, having a plan in place will give you the confidence boost you need to actually make this happen! Get advice from others who have done what you want to do. Learn from their mistakes. Read books from and about them. Having lots of information before you head into something is always a great way to be prepared. Some people have a dream of traveling across the globe in a year or hiking to the top of Kilimanjaro. Although it’s great to have goals, you need to make sure your dreams are doable for you within the time frame you have set. You should still challenge yourself and not make your goals so easy that there’s no motivation or sacrifice involved. Of course we’re going to tell you to do a budget! Dreams can cost money. Whether it’s $300 for a flight lesson or $5,000 for an Italian getaway, money is a crucial factor. Write up a plan for your moneyto make sure you have what you need to chase your goal. Need to generate extra cash to reach your goal sooner? I can show you the method that I used to generate more income to pay cash for a used Cadillac CTS when we needed to get a better car. We did it by starting a home based business. I can show you how to start your own business with no up-front investment, no pyramid that requires a monthly auto shipment costing you money instead of creating money, and no selling of lotions, or potions or pills, or quick magic diet aids that melt away inches in minutes or other such scam promotions. Stay tuned to the end and I will share with you how to learn more. 5. Take a chance and go for it! This step can be the hardest one to do because fears are holding you back. But if you’ve followed the previous four steps, you’re ready! Now it’s time to make it happen. Don’t talk yourself out of this dream. Life involves risks, but when you’ve planned ahead, those risks are a little less scary to take. Once you’ve mastered these five steps, you will soon be marking off your dream from your bucket list. Perhaps it will even inspire you to dream up more goals for yourself! Conquer whatever it is that’s stopping you and achieve new results. Also if you want to learn more about how to create extra income by starting a home business that requires no startup capital, no pyramid that requires a monthly auto shipment that cost you money every month instead of creating money, and no selling of lotions, or potions or pills, or quick magic diet aids that melt away inches in minutes or other such scam promotions visit http://AIMHighForSuccess.com. Start Today! I just want my kids to have it better than I did. But that new RV will help our family bond. You’ve had it—you’re finally ready to say “hasta la vista” to debt. But how can you get the rest of the family on board? The journey to debt freedom is going to be a long one, and you’ll need all the support you can get. Every family handles the journey differently. Here are three important steps you can take once you’ve decided to get out of debt. Now schedule a family meeting, hit these three points, and get to work. You may be surprised how often people skip this part—but it’s the first step! If you cut the cable and unlimited data plans without telling your spouse or your kids what’s happening—and explaining why—you might be in for World War III when you get home. Communicate first. Hopefully you and your spouse are already on the same page. But if you’re not, sit down and talk about why you want to get out of debt. Dream together about what life will look like when you don’t owe anything to anyone. Will you save for a new car? Go on a dream vacation to Italy? Build a school in an impoverished community? If your kids are old enough to understand work and money, loop them into the discussion. Don’t let this educational opportunity pass. Use it as a chance to teach them about the power of money—and how to set tangible, long-term goals. You might be surprised by just how much they’re paying attention. The only way to eat an elephant is one bite at a time. Getting out of debt may take six months—or six years. The average family that goes through Dave Ramsey’s, Financial Peace University (FPU), is debt-free except for their house in 18 months. But let’s face it: you didn’t get all that debt overnight, so you’re not going to get rid of it overnight either. Avoid burnout by celebrating small wins throughout the journey. Those little victories help you keep the process rolling. Say you owe $60,000 in student loans. Instead of waiting to celebrate until it’s all paid off, plan small victory laps along the way. Maybe every time you shave off $5,000, you go out to dinner or take the kids to a movie. Don’t go over the top—this isn’t permission to take a trip to Disney World each time you make another payment. But breaking a big goal into small benchmarks will keep you energized and motivated. Those little wins add up! There’s power in numbers, which means you’ll get more done if you work together—as a team. The Belgian draft horse, one of the largest, strongest horses in the world, can pull a hefty 8,000 pounds on its own. But when you pair it with another horse, they can pull upwards of 24,000 pounds—three times as much as one can pull on its own. Moral of the story? If you want to get further faster, work as a team. This is especially true if you’re climbing out of debt with your spouse. Keep in mind—the enemy is debt, not your spouse. So schedule monthly budget meetings. Cheer each other on. Offer regular encouragement. You’re in this together! You won’t get out of debt overnight, but the journey will be easier—and more fun—if you communicate, set benchmarks, and work as a team. Get the kids involved! And let your friends and family know what you’re doing. You never know how your story could change someone else’s family tree. Also if you want to learn more about how to create extra income to get out of debt, to create extra income by starting a home business that requires no startup capital, no pyramid that requires a monthly auto shipment that cost you money every month instead of creating money, and no selling of lotions, or potions or pills, or quick magic diet aids that melt away inches in minutes or other such scam promotions visit http://AIMHighForSuccess.com.